First class appraisal of the Christian worldview contrasting with the Darwinian one. Eight good Bible studies based on the miraculous signs in Johns gospel. Of particular value I enjoyed the series of chapters on... I believe because...Anyone interested in learning to share the gospel with others will find this book beneficial. review published in Does God Exist journal March/April 2012.. written by John ClaytonEvangelism in a Post Christian Cultureby Alastair Ferrie, iUniverse.com, 2008, 219 pages,$18.95 (paperback), ISBN-13: 978-0-595-53005-2 In 2010 we were privileged to work for several weeks with various congregations in Scotland. Dr. Alastair Ferrie was our primary contact. He is a minister in Dundee who has a strong academic background and is a physics major. 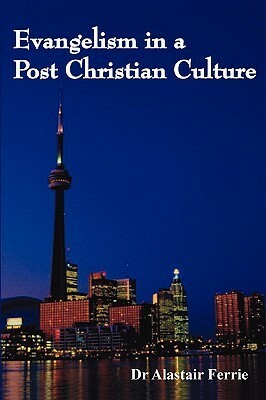 Dr. Ferrie has written a book that we feel will be of interest to ministers and personal workers throughout the world. He has been doing a number of presentations in the United States at various university lectureships and workshops. Because he is Scottish and has an understanding of the European “Post Christian” mind-set his understandings and suggestions carry great significance.Under the heading “The Changing Face of Evangelism” Ferrie begins by developing the concept of how worldview has affected the approach needed to reach people today. He correctly identifies how people think about God and religion and how ignorance has impacted our approach to people. The implications of naturalism and evolutionary thought are carefully described and well handled. There are excellent charts on the contrast in beliefs and where those beliefs take one. Ferrie also emphasizes the importance of using the Bible and using it correctly. How and what we share is carefully explained and is well done.The second section of the book consists of eight presentations that can be used in home studies. Ferrie says “They are a structured approach to sharing the gospel, sharing the Person of Christ with others.” What Ferrie does is to take eight biblical miracles and use them to explain Christ and the concept of Christianity. These are structured so a person can add his own approach based on the fundamentals the book gives. The last five chapters are apologetic chapters that start with “I believe because …” and offer answers to faith issues. These are basic, practical, easy-to-use approaches which answer common questions. If a person does not believe the Bible is the Word of God, quoting scripture will not usually work. For that reason, I would have put these chapters closer to the front of the book. This book is intended for Christian workers and for some people the apologetics section might not be needed.This is an excellent book and we recommend it highly to people who are interested in seeing the church grow, and who are willing to do what God put us as Christians here to do — to spread the Good News about Jesus and salvation. --------------------------------------------------------------------------------Back to Contents Does God Exist?, MarApr12. Dr. Ferrie more than adequately handles the subject of presenting the Gospel in this volume. He builds an effective foundation and methodically reveals the essential building blocks of Christian Evangelism. With church membership declining in the western world and the invasion of a lackadaisical social gospel, this book offers solid hope for equipping devout believers with the tools we need for building the Kingdom on earth.Alastair is an excellent writer who never skips a beat. You won't be tripping over poor structure or fractured ideas. He is fluid and convincing in his literarary presentation. I recommend this book for all Christians who take their belief's seriously and for those who could become convinced that they should.